Prior to 2003, Indianapolis banker and financial advisor Charles A. Liles began to sense a lack of unbiased, independent and fee-only investment and wealth management advice for individuals and families with investment assets under advisement beginning at $500 thousand. With that need in mind, in the autumn of 2003, he founded Charles A. Liles & Associates, Inc. The firm is a Registered Investment Advisor in the State of Indiana and brings to its client base the investment education, planning and process used for years by institutions and high net worth families. By working with Charles, clients gain confidence from the knowledge that a commitment to fundamental principles, a well-defined process, time, and patience are the keys to unlocking a successful investment and wealth management program. Clients also appreciate the time and value Charles brings to evaluating and integrating all aspects of insurance, savings and credit, estate planning and family giving, charitable giving and philanthropy, retirement planning, and taxes into a complete wealth management plan. He has over thirty years of financial services experience and formerly held several positions at Indiana National Bank, which, after a series of mergers, ultimately became JP Morgan Chase. 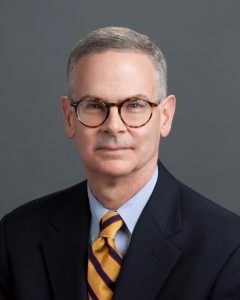 There, Charles was named First Vice President of Banc One Capital Markets with responsibilities in investment planning and capital markets for public funds, insurance companies and large health care systems. He left the large corporate setting in 2001 for Oxford Financial Group, a 100-person multi-family office, investment consulting and trust company located in Carmel, Indiana. He served as Assistant Director of Investment Services, working with foundations, endowments and individual clients to fashion unique investment programs tailored to each client’s specific financial goals and circumstances. He was known for an unusually thoughtful review of clients’ needs, sound recommendations, and exceptional personal service. A strong sense of community volunteerism led Charles to leadership positions with the Economic Club of Indianapolis, the Indiana Historical Society as Trustee and Treasurer, and the Indianapolis Branch of the English-Speaking Union. His professional affiliations include NAPFA (the National Association of Personal Financial Advisors, an association of fee-only financial advisors), the Estate Planning Council of Indianapolis and the Cornerstone Council of the Central Indiana Community Foundation. He is a graduate of the University of North Carolina at Greensboro with high honors in business and economics. He and his wife Lisa are the proud parents of Charles, Jr., a graduate of Indiana University and working in the Los Angeles area, and David, who lives in Indianapolis. Charles and Lisa attend Second Presbyterian Church where he serves as an Elder, and a Trustee of the Church’s Endowment.